The University of Wisconsin-Milwaukee is the largest university in Milwaukee and the second largest (behind UW-Madison) in Wisconsin. In 2016, UWM enrolled 27,000 undergraduate and graduate students with a faculty and academic staff of more than 1,600. That same year, UWM was classified as a top-tier, Category 1 Research University by the Carnegie Classification of Institutions of Higher Education. As of early 2017, UWM offers 97 undergraduate, 64 master’s, and 33 doctoral degree programs. In athletics, UWM competed in fifteen women’s and men’s sports at the NCAA Division 1 level. The Wisconsin State Legislature created UWM in 1955 by authorizing the merger of two institutions: the Wisconsin State Teachers College, Milwaukee and the University of Wisconsin’s Milwaukee Extension Division, both of which traced their histories back to the late nineteenth century. Established in 1885, the Milwaukee Normal School offered a two-year program at 18th and Wells streets to train teachers. The Normal School moved to an East Side campus at Downer Avenue and Kenwood Boulevard in 1909 and then in 1911 broadened its curriculum to include the fine arts, the liberal arts and sciences, and pre-professional programs. In 1926, all of the normal schools in Wisconsin were renamed as state teachers colleges and authorized to offer four-year degrees. In the next two decades under the leadership of Frank J. Baker, the Milwaukee State Teachers College established a national reputation for innovative and experimental programs in teacher education. In 1951, the college was renamed the Wisconsin State College, Milwaukee and admitted its largest freshman class to date, more than 500 students. Meanwhile in accord with the Wisconsin Idea, a few University of Wisconsin faculty members in the 1890s travelled Milwaukee to offer college courses, but the Milwaukee office of the UW-Extension Division was not created until 1907. In 1923, the Extension Division in Milwaukee instituted a formal two-year liberal arts program for high school graduates along with programs in engineering, commerce, and pre-professional fields. Students were expected to finish their degrees at the main campus in Madison after taking two years of classes in Milwaukee. In 1928, the Division moved into a building at 6th and State streets. The Extension Division offered both evening and day courses to working adults and college age students. It became apparent by the end of World War Two that neither the Teachers College nor the Extension Division could alone meet the higher education needs of Milwaukee. But, in spite of considerable public and political support in Milwaukee, the creation of a comprehensive public university proved to be challenging for several reasons. First, political interest in the state capital was lukewarm. Second, the State Teachers College System and the University of Wisconsin each sought to prevent the other from controlling public higher education in Milwaukee. Third, various interests from outside of Milwaukee feared and opposed the creation of a large public university in the state’s largest metropolitan region. Finally, in 1955, after several unsuccessful efforts, the legislature and governor approved the merger of the State Teachers College and the Extension Division in Milwaukee. The new University of Wisconsin-Milwaukee was placed under the direct control of the University of Wisconsin-Madison and its Board of Regents. Lasting until the early 1970s, these controls impeded UWM’s growth in some ways, but they also ensured that UWM emulated the academic values and high standards of the University of Wisconsin. The decision was also made to keep the university’s main campus on the East Side site of the Milwaukee State Teachers College. 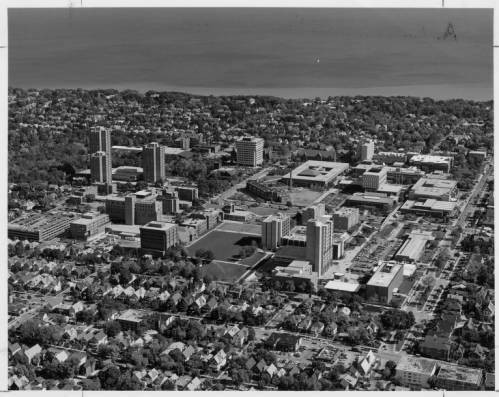 This decision confined UWM to a main campus of less than 100 acres, but its urban location meant that UWM would be a vital and integral part of Milwaukee. In its early years, UWM grew quickly. In the fall of 1956, UWM opened with 6,195 students served by 150 faculty members. Six years later, the enrollment had grown to 9,354 students and the faculty increased to more than 400. 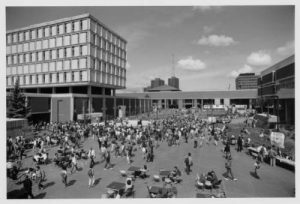 During the booming 1960s, the university prospered under the leadership of UW President Fred Harvey Harrington and UWM Chancellor J. Martin Klotsche, both of whom envisioned UWM developing into one of the nation’s leading urban universities. Although opposed by some political and educational interests, this commitment to major, rather than regional, university status was affirmed by the UW Board of Regents. As a public urban university, UWM had a comprehensive teaching, research, and public service mission and was also expected to provide access to students who were unable to leave Milwaukee or to afford another university. In addition, as a research university, UWM was also expected to produce a major impact on the economy, culture, education, and quality of life in Milwaukee. In the 1960s, UWM enrollment skyrocketed. By 1971, the enrollment reached 22,000 with a faculty of 750. During the 1970s and 1980s, the growth of UWM slowed, reflecting national and state trends in higher education. Enrollment continued to grow, but fiscal resources and physical facilities lagged. Nevertheless, by 1990 twelve UWM schools and colleges enrolled almost 25,000 students served by 800 fulltime faculty members. In 1994, UWM achieved one of its original goals by being recognized as a Category 2 Research University by the Carnegie Classification system. During the 1990s, the university dramatically improved its physical plant by modernizing existing facilities and building new science, architecture, and business buildings as well as a large, renovated facility in downtown Milwaukee to handle its extensive outreach programs. Between 1999 and 2015, four different individuals served as Chancellor. Nevertheless, growth continued. In that time, UWM added a School of Freshwater Sciences and a School of Public Health. Enrollment reached 30,000 in 2009. UWM also launched an Innovation Campus for collaborative research, acquired the Columbia St. Mary’s Medical Campus (located adjacent to the main campus), and opened a new Interdisciplinary Science Research Center on campus. The UWM Foundation also completed a $125 million capital campaign and increased its assets to $202 million. Since its creation, UWM has had both a tangible and an incalculable impact on Milwaukee. In 2015, UWM supported more than 14,000 jobs and had an overall economic impact of $1.5 billion. More than 76 percent of the university’s 165,000 living alumni resided in Wisconsin, most of them in Milwaukee. In the span of a half-century, UWM had grown from an institution that was small and controversial into a university that is firmly embedded into all aspects of Milwaukee. ^ “2016-17 Facts and Impact,” University of Wisconsin-Milwaukee website, last accessed April 4, 2017. ^ An excellent institutional history is Frank A. Cassell, J. Martin Klotsche, and Frederick I. Olson, The University of Wisconsin-Milwaukee: A Historical Profile, 1886-1992 (Milwaukee: UWM Foundation, 1992). ^ For a firsthand account, see J. Martin Klotsche, The University of Wisconsin-Milwaukee: An Urban University. Milwaukee: UWM, 1972). Cassell, Frank A., et al. The University of Wisconsin-Milwaukee: A Historical Profile, 1885-1992. Milwaukee: UWM Foundation, 1992. Klotsche, J. Martin. The University of Wisconsin-Milwaukee, an Urban University. Milwaukee: University of Wisconsin-Milwaukee 1972. Nealson, Molly S. ed., The Graduate School, 25 Years, 1965-1990: Excellence in Graduate Education and Research: University of Wisconsin, Milwaukee. Milwaukee: UWM Graduate School, 1990.